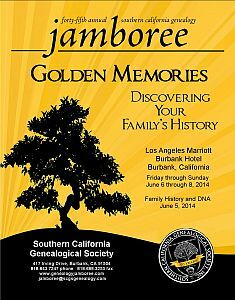 It’s the 50th anniversary of the Southern California Genealogical Society… and that means Jamboree! Burbank will be hopping, starting with the Family History and DNA Day sessions today and on into three more days of Genealogy Jamboree at the Los Angeles Burbank Marriott. It’ll be great fun, it’ll be a chance to learn lots of new things. But… but… but what if you can’t be in Burbank? And, starting tomorrow afternoon Pacific time, there will be free livestreamed sessions from the Genealogy Jamboree, thanks to Ancestry.com which is underwriting the expense. You do have to register, but registration is easy: just click on the link for whatever session you want and follow the directions (you’ll get a confirmation by email). Remember that everything is in Pacific daylight time, so add one hour if you’re in the Mountain time zone, two hours if in Central and three hours if in Eastern. You will receive an emailed confirmation. If I don’t see you there, I hope you see some of us wherever you are!